There have always been two Americas. One is shameful and the other is admirable. Now, every citizen needs to decide: In which America do you want to live? For which will you take a stand? We have been the America that stole land from and exterminated Native Americans. We have been the America that limited the right to vote. We have been the America that shackled and enslaved Africans, granted them freedom and then took those freedoms away. We have been the America that has denigrated and excluded eastern and southern Europeans and Asians. We have been the America that imprisoned innocent Japanese Americans. We have been the America that turned its back on Jews who fled Nazi extermination, sending them back to their slaughter. We have been the America that deported and detained dissenters. We have been the America that has left people homeless and destitute. We have been the America that threw off tyranny to establish freedom of the press, speech, and assembly. We have been the America the expanded the right to vote. We have been the America that was founded on the principles that prohibited the establishment of or interference with free exercise of religion. We have been the America that took in refugees from around the world and welcomed dissent. We have been the America that along with our allies liberated Hitler’s concentration camps. We have been the America that takes care of one another. Whatever, they say and whatever lies they may tell the disempowered, Trump and his empowered supporters are determined to bring back the former. People fought and died for the latter. The former brings us selfishness and hate. The latter brings us mutual responsibility and love. Now, we are engaged is a fierce battle between two visions of America. You cannot be neutral. 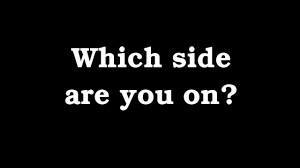 You have to take sides. « The Evidence Is In. Evidence and Morality Are Out. I do not want to return to the former kind of greatness of America. I thought we were establishing the America in the last paragraph. I shudder to think of returning to the former America. I haven’t read all your posts, but guess we are on the same wave length. Perhaps you and yours would be interested in the commentary from The Foundation for Democratic Education?